I really wanted to make a cube that will have a lot of color woods to have an attractive looks...so i did. I think the result is quite nice and some of the woods are hard to find.all pieces are dissimilar and non symmetrical. It has one sliding axis (tricky) and because of the color symmetry on diagonal it gives clues to the assembly solution.Thats for the 12 color version. The next cubes i am going to make are going to be two colors like a checker and the solution is not really given from the 2 color woods version. 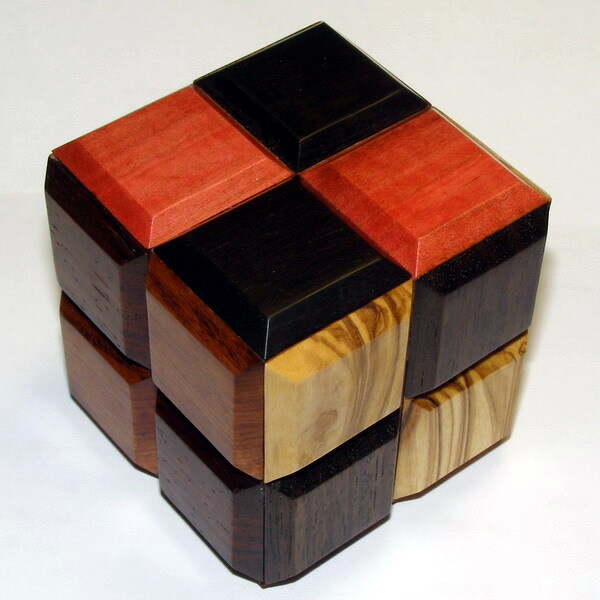 See more pics of the "Color cube" puzzle.or Back to puzzle index.